When it comes to January, I am of two minds. On the one hand, I am so, so tired of winter and the lack of sunlight. On the other hand, I appreciate the desire for change and improvement that comes with the new year. The Christmas decor has been neatly put away in the basement, I am in the process of organizing my house (it's a never-ending process), I am taking my vitamins and other supplements regularly (see this post for more information) and I'm cooking healthy meals more often. A key part of improving health and wellness is examining our mental health status. And with the aforementioned winter doldrums, January is the perfect time to do just that. The dark, extremely cold days can be so depressing. It can be serious business for some people and seeking a mental health professional or reaching out to loved ones might be called for. But if you just need a bit of a boost, I think books are a great resource. I recently received a few DK books that are geared to restoring balance for yourself and your loved ones. Read on to the end of this post to enter for a chance to win two of them. Who doesn't have stress? For real. Clearly we all do, from tiny babies to full-grown adults. Stress: The Psychology of Managing Pressure begins with an explanation of what stress is and what it isn't (ie. not to be confused with anxiety, worry or fear). Next up, stress isn't necessarily a bad thing - we kind of need it - but our relationship with stress is more the issue. The book encourages us to identify our stressors - maybe you're planning a wedding, having health concerns or dealing with a tough commute. Then there are coping mechanisms, ideas for keeping a stress diary and tips for breaking the worry cycle. What I found particularly interesting is the section on stress in the digital age, with ideas for eliminating digital clutter and how cell phones can harm our sleep and our emotional health. Other sections tackle stress and relationships, the pressures of parenthood and job burnout. Of course there are plenty of tips for managing stress - music, nature and the power of forgiveness among them. 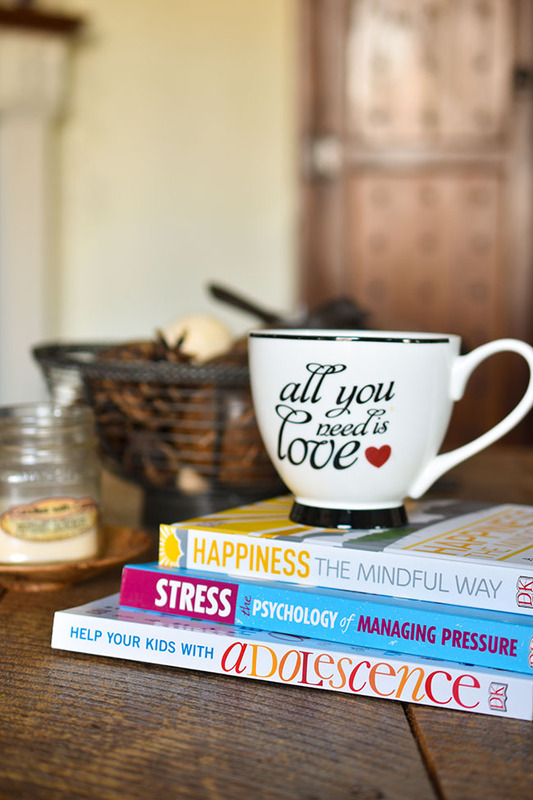 Topics are easily digestible, with two-page spreads on issues such as how to be a stronger caregiver, managing the stress of conflict and dealing with frustration. There are breath control and muscle relaxation techniques, and also ways to prioritize, eat better, exercise and declutter (a major stress for many of us!). Animals, arts and crafts, friends and humour are all good things. Overall, this book offers up motivation and insight into treating ourselves better and overcoming our toxic relationships with stress. I have written about mindfulness before and I admire those who practice mindfulness meditation regularly. (You can read more about how to be mindful in this post.) But I always have a bit of a mental barrier when I think about mindfulness, an anxiety about whether I'm actually able to sit and be still and focused. I remember when I used to take yoga classes I had a lot of trouble with the guided relaxation at the end of each class. When the instructor said to let your mind relax, that got me thinking all the more about my to-do list and I had a strong urge to just be on my way. Happiness The Mindful Way offers small, manageable steps to mindfulness practice. For example, you can introduce your mind to the practice by sitting at a table with an object such as a mug or salt shaker in front of you. You're asked to look at the object for a few minutes, regarding its characteristics without judging its beauty or utility. The instructions go on from there, but rest assured it's a manageable start, even for racing brains. The practice gives you a break from your preoccupations. Fortunately, the book says, mindfulness is not about emptying the mind or stopping thinking (who can do that? ), but rather about recognizing feelings without getting caught up in them, living more in the moment and cultivating happiness. 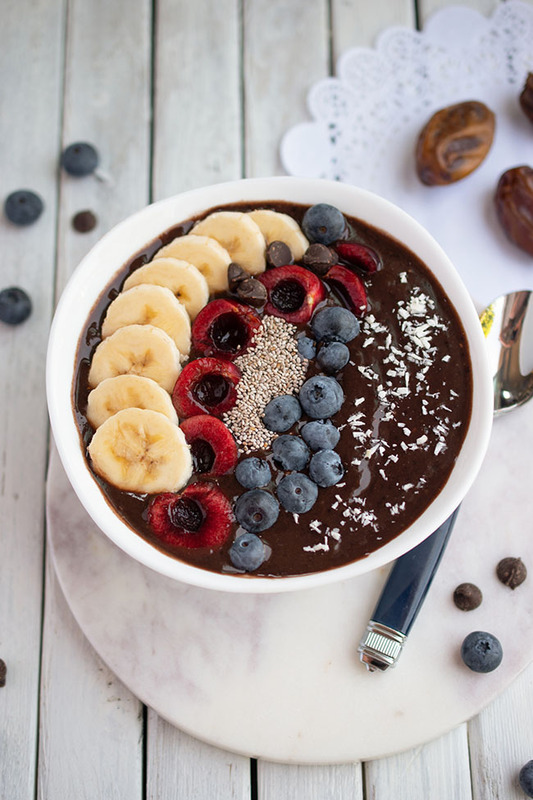 "The main ingredient in the mindfulness recipe is the present moment." If you find mindfulness meditation a bit of a hassle, think of the benefits. It is said to reduce stress, thereby boosting immunity. It helps with pain relief and sleep patterns. It may also make us more attentive, grounded and confident. "No longer held back by negative patterns of thought about ourselves, we set ourselves on the path to releasing our full potential." The topics and practices in Happiness The Mindful Way are laid out in two-page spreads, so you can open the book to any page and find information or an activity that will help you be more mindful. While some of it has to do with sitting still in practice, you can also find mindfulness through new experiences and repetitive chores. I think this format makes mindfulness practice less daunting, because you could read for just five or 10 minutes each day and still achieve benefits. When you are ready for sitting mindfulness meditation, the book has full instructions for that too, with three week-by-week breath, body and insight programs. There's a five-minute mindful breathing meditation too. And there are four easy yoga poses - which, I'm thinking, is my cue to get back into yoga class. After I've tackled more of the practices in this book, I think I'll be ready for that guided relaxation at the end of class! I'm sure most of us could do with more practice being attentive to the here and now rather than being stuck on past experiences or anxious about the future. If that's how you're feeling right now, this might be the book for you. It aims to help us boost self-esteem, nurture more fulfilling relationships, concentrate better, overcome stress and achieve happiness. I remember when I was a kid and I thought it was so funny that my mom had a copy of the popular 1969 self-help book I'm OK-You're OK on her bookshelf. My sister and I also used to laugh when Mom was watching a movie and she had to lift her eyeglasses to wipe tears from her eyes. Yeah, I'm that mom now (complete with glasses and tears). 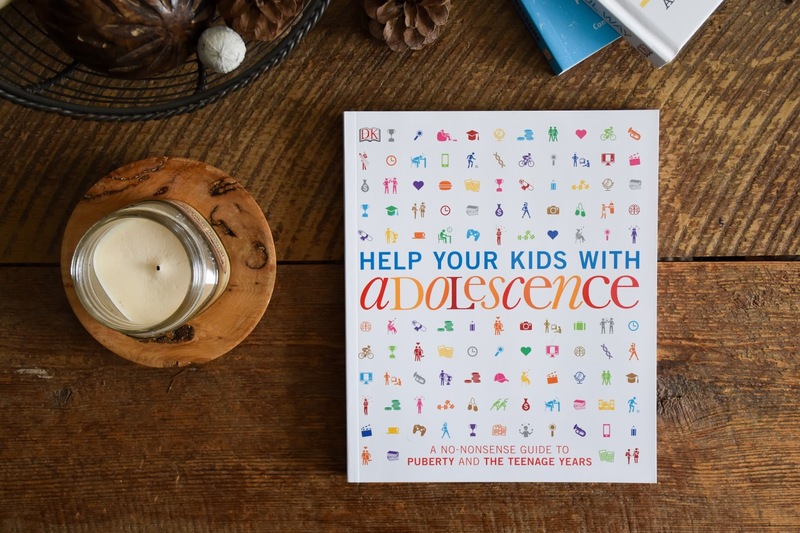 Only my kids were rolling their eyes at this book: Help Your Kids With Adolescence: A No-Nonsense Guide to Puberty and the Teenage Years . It's okay, the kids don't have to like the book. I'm the one who is going to read it. And it will benefit them without them knowing it. With my youngest having turned 13 last October, we have no more little ones in the house. In fact we have two teens, so we're navigating new and rather unfamiliar territory. I mean I was a teenager (a few years back), but that's the extent of my knowledge. According to the foreword, "Sometimes parents see themselves as having less influence on their children as they grow up, but research suggests otherwise. The majority of young people say they want to talk with their parents about the big issues in their lives." It's just that sometimes - when you get grunts for responses - you wouldn't know it. Am I right? Another important note from the foreword (by Dr. Karen Rayne), "I see how much healthier and grounded teens are when their parents talk with them openly about a wide range of topics, from sexuality and religion to politics and race, as well as puberty, staying safe online, and peer pressure." I am completely (well almost completely) comfortable talking to my kids on most any subject. Sometimes they'd like me to stop though. Help Your Kids With Adolescence can be read by parents or adolescents and it's also designed to be read together. It guides readers through the physical, emotional and social changes that adolescence brings, with pages about having a healthy mind and body, puberty, relationships, school, social media and sexuality. Biological changes are detailed in diagrams, with labels and scientific explanations. Coloured boxes offer extra information and practical advice. Blue boxes offer hints for teens, purple boxes have tips for parents. Like the other two books, information is shared in small, digestible portions so it's a great book to pick up when you have a few spare minutes. At the risk of offending my children, sometimes teen logic is a bit...off. The chapter on teen brains helps us understand why. In fact, during puberty the brain experiences its most dramatic transformation. The brain is also responsible for the habit of staying up late and having difficulty waking up in the morning. So we parents need to have a little bit of understanding...as hard as that can be, what with schedules to keep and all that. There's a chapter on mood swings too (ahem) and chapters on gender and gender stereotypes. The book looks at female hormones, the menstrual cycle and menstrual care, male hormones, breaking voices, sweat, smells, pimples, eating disorders, money matters, unhealthy relationships and a whole lot more. Help Your Kids With Adolescence is a good starting point for parents in understanding their teen(s) and helping them through critical issues. Obviously if an issue becomes more serious, it would warrant further research and possibly external help. Which of these books most interests you and why? Enter to Win Happiness The Mindful Way and Stress: The Psychology of Managing Pressure! 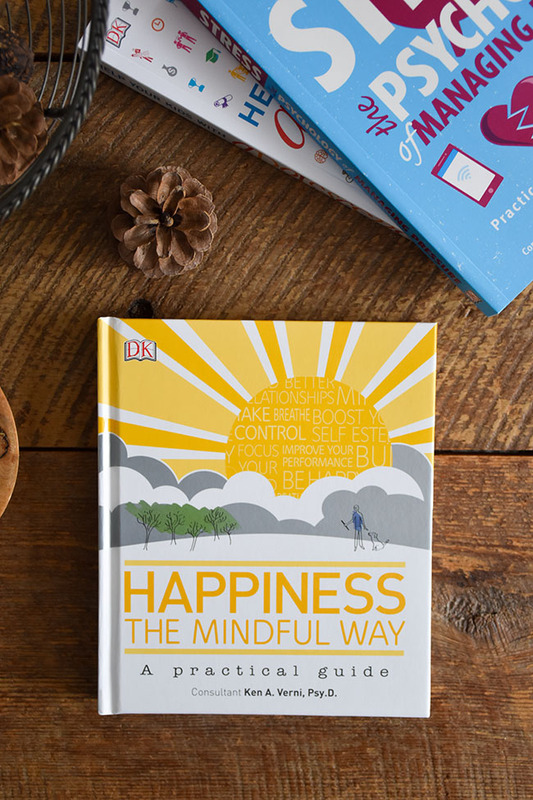 Thank you to DK Books for providing one lucky winner with copies of Happiness The Mindful Way and Stress: the Psychology of Managing Pressure. Canada only. Enter using the rafflecopter widget below until February 7th. I am interested in the Help Your Kids With Adolescence: A No-Nonsense Guide to Puberty and the Teenage Years book because I have a tween and it would be nice to gain more insights on how their minds work at this age. Happiness: The Mindful Way, because I think happiness is something you can decide to be. And I definitely would like to learn to accomplish this! I'm most interested in Happiness The Mindful Way because I always want to practice being more mindful! I'm most interested in Stress: The Psychology of Managing Pressure, because I'd like to learn more about managing stress. I'm interested in the book Stress: The Psychology of Managing Pressure. I'd love to learn some tips. 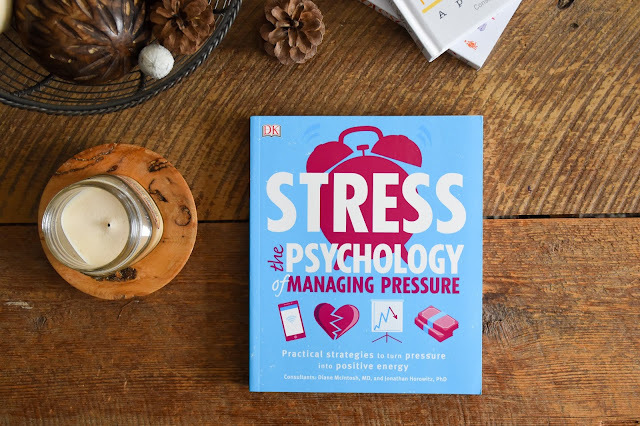 I'm most interested in Stress: The Psychology of Managing Pressure because I am not great at managing stress and could definitely benefit from learning some coping mechanisms! might be good for my depression. Happiness the Mindful Way as I think even as adults we have been sucked in by a vacuum of teenagers and children, who have change our way of thinking and the use of our manners. I believe if we revisit this it might remind us of how polite everyone was and how happy we once were. Hopefully in a polite and mindful way we can teach these next generations, which should help in the long run to alleviate our stress and theirs. 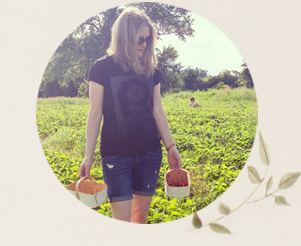 I'm most interested in Happiness the Mindful Way because I try to practice mindfulness and I'm also interested in doing whatever I can to have a happier life. Happiness and anti-stress.....two things that I am constantly in search of keeping if I don't have or defend with everything I have in me if I am already in possession of. Would love to win the book! happiness the mindful way is most interesting to me as I am always looking for way to simplify my life. I would like Happiness The Mindful Way, because you can look at the characteristics of the objects.